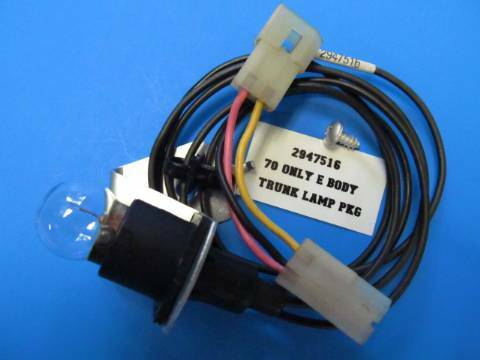 70 ONLY E BODY CUDA/CHALLENGER ORIGINAL 2947516 RESTORED TRUNK LAMP. NEW CORRECT REAL PLATING, NOT PAINTED OR JUST CLEANED UP, NEW WIRES TERMINALS & CORRECT PLUGS AS NEEDED. ORIGINAL PLATED MOUNTING SCREW & GE 1003 BULB AS ORIGINALS WITH NEW LABEL. SWITCH & OPERATION TESTED. ALSO INCLUDES SPECIAL UNIQUE ABS PLASTIC CLIP THAT HOLDS WIRE TO TRUNK HINGE.